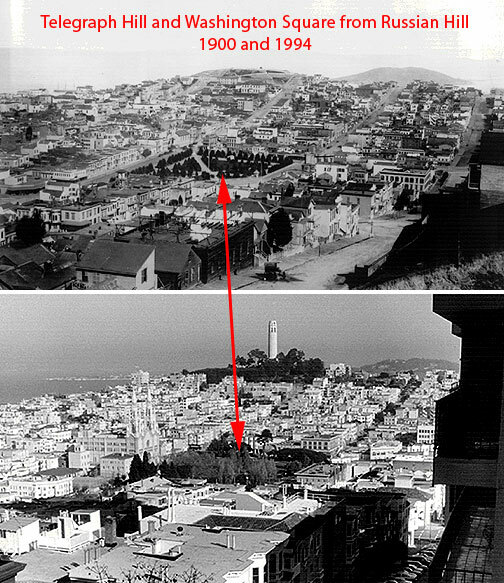 Difference between revisions of "Telegraph Hill Historic District"
from the City of San Francisco Planning Code, Appendix G to Article 10: Telegraph Hill Historic District, passed Nov. 13, 1986. Telegraph Hill is one of the most famous hills in the world, as well-known as Sugar Loaf in Rio de Janeiro, and a visual landmark to sailors entering the Bay since its European discovery by Capt. Juan Manuel de Ayala in the San Carlos on August 5, 1775. The second European to enter the Bay, Capt. George Vancouver in 1792, specifically mentioned the anchorage he had between two promontories, one of which was Loma Alta, the original name for Telegraph Hill. 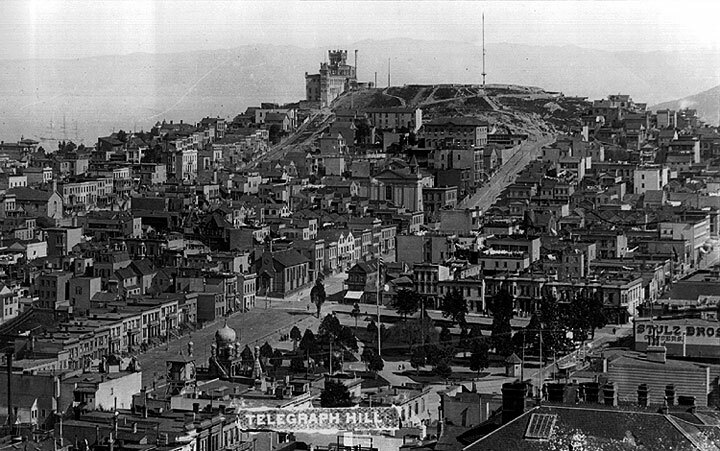 Telegraph Hill is famous as the hill that's been around the world as great portions of it were blasted out for ballast in sailing ships ultimately to be used to pave the streets of various exotic places. The Hill's present configuration is the historical expression of the ravages created by quarrying. The rock was used not only for ballast, but also to build Gold Rush era warehouses (in a combination of brick and stone known as rubble), to fill the Bay for flatlands to the east of the Hill, and to build the seawall which stabilized San Francisco's waterfront. The last quarrying occurred as late as 1914. 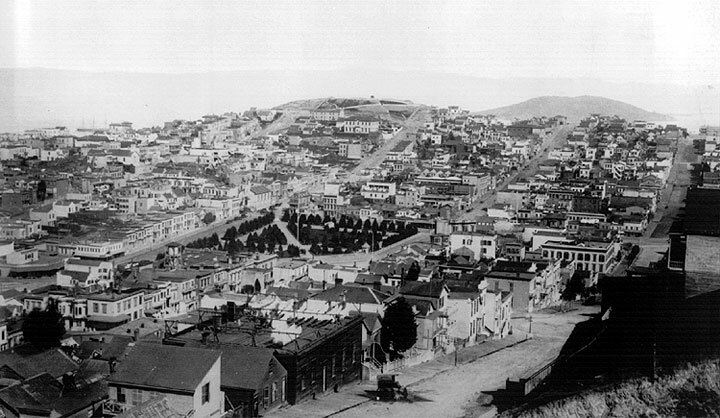 The Historic District is a unique expression of the pattern of development which took place on the east slope of Telegraph Hill from 1850 to 1939. Topographical constraints shaped the original settlement of the Hill. The difficulty of access on hillside and cliffs, and the proximity to the City's most active waterfront area first produced a community of waterfront workers housed in "cloth lined" shacks and modest vernacular Gothic Revival houses. Intact groupings of these buildings remain with the District, and comprise the City's largest concentration of pre-1870 structures. 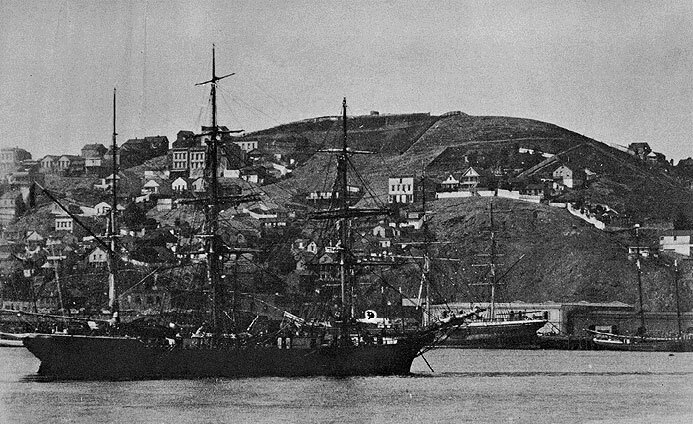 While other areas of the City experienced ongoing development through the nineteenth and early twentieth centuries, Telegraph Hill remained isolated. Bypassed by cable car or streetcar lines and with vehicular access limited to Union Street, infill residential construction from 1870-1935 was limited to small-scale vernacular construction stylistically comparable to the earliest development on the Hill. Due to the cliffside location, steps, wooden walkways and a hidden network of footpaths developed throughout the area. Street paving of Montgomery and Alta in 1931 and Union and Calhoun in 1939-1940 improved general accessibility, and heralded new development in the area. Low property values facilitated real estate development. Owners retained an array of architects who produced a collection of noteworthy and (then) innovative designs. Among these are Richard Neutra's International Style Kahn House at 66-70 Calhoun Terrace (1939), and Irvine Goldstine's Art Modern Malloch Apartment Building at 1360 Montgomery Street (1936). This change in style, scale and pattern of development punctuates the district's period of significance. The steep cliffs, a decisive factor in determining the historic development pattern of the area, are a highly significant aesthetically important component defining the setting of the District. The abrupt changes in grade produce dramatic and unique vistas at points throughout the District. Unimproved street rights-of-way are valuable open spaces ranging in character from the well-tended, renowned Grace Marchant and Valetta's Gardens on Filbert and Greenwich Streets, to the rock-face cliffs of Green and Calhoun Streets. 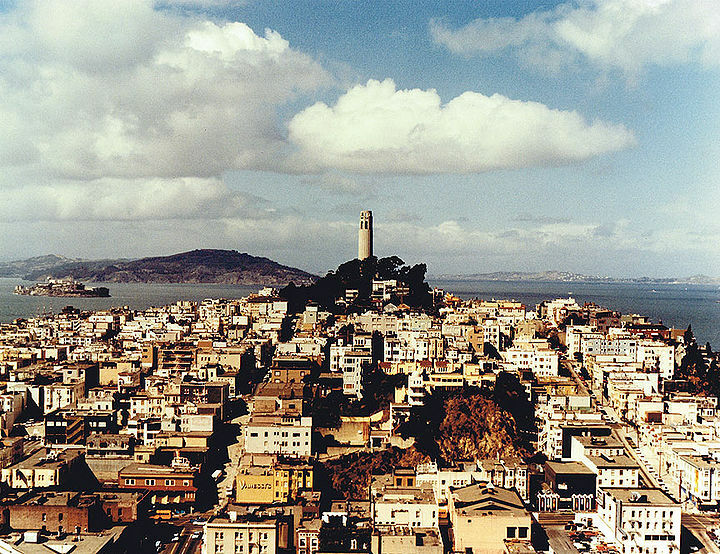 Coit Tower and Telegraph Hill, c. 1960s.